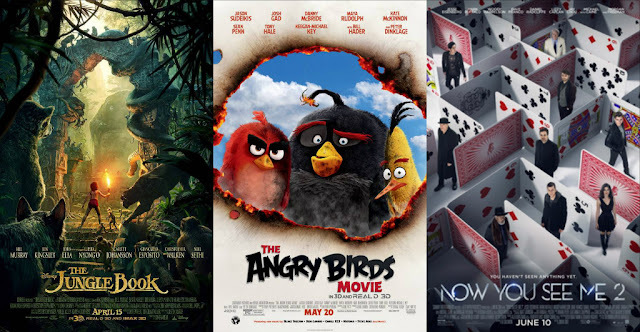 Dearest Blog: Yesterday it was off to Marquee Cinemas for Now You See Me 2 and Warcraft...except I couldn't bring myself to face Warcraft and ended up catching up on The Jungle Book and Angry Birds instead. First on the docket: The Jungle Book. When the vicious tiger Shere-Khan threatens his life, Mowgli, a boy raised by a wolf pack, is forced to flee his jungle home. The Jungle Book is a gorgeous film, and a vote of confidence for CGI at a time when, let's face it, even the biggest-budget CGI is starting to look a little dodgy. The movie is probably eighty-percent jungle and jungle animals, and the only time you can tell most of it is fake is when the bear starts singing. I've never seen a real one sing. Then again, my experience with bears is somewhat limited. Outside its technical virtures, the movie's main plus is some great voice work from the likes of Idris Elba, Ben Kingsley, Bill Murray, Lupita Nyong'o, Christopher Walken, and Scarlett Johanssn. Unfortunately, it's merely a silver lining on what's ultimately a pretty boring picture. The movie tiptoes around its brutality, with most of it played out off screen. It would have served no one's purpose for a kids' film to be a total bloodbath, but the impact of losses is certainly diminished. There are chases and plenty of other action, but the movie is plain dull in its execution. The second half, in particular, seems to drag on forever. The Jungle Book clocks in at 106 minutes and is rated PG for "some sequences of scary action and peril." Worth a look for its technical prowess alone, 2016's Jungle Book sadly falls short of the animated feature on which it's based. Of a possible nine Weasleys, The Jungle Book gets five. Fangirl points: Giancarlo Esposito. Again! Next up: The Angry Birds Movie. An island of peaceful, (mostly) happy, flightless birds faces a threat from neighboring green pigs. Whoa. Trippiest. Synopsis. Ever. Dear Reader(s), I have not even a passing familiarity with video games. Luckily, The Angry Birds Movie is pretty cute, and I don't think I missed out on anything for not having spent hours with my nose in my phone, playing the Angry Birds game. Angry Birds is a great-looking picture, full of gorgeous animation and bright colors. The film boasts an impressive array of voice talent, including Jason Sudeikis, Josh Gad, Peter Dinklage, and Sean Penn. The plot is pretty thin, but the film keeps moving and doesn't bog down. There's some charming humor alongside some that's truly disgusting...at least for grownups...as well as a lovely score by Heitor Pereira. The Angry Birds Movie runs 97 minutes and is rated PG for "rude humor and action." It's no game-changer, but Angry Birds is a bright, colorful, quick-moving film that's fun for the whole family. Of a possible nine Weasleys, The Angry Birds Movie gets six. Finally, the closer on yesterday's agenda: Now You See Me 2. After hiding out for 18 months, the Horsemen resurface to perform their greatest heist yet. When the first Now You See Me was released into a summer of prequels, sequels, and reboots, I recall lauding it as a breath of fresh air in a sea of franchise installments. Of course, then Hollywood had to go and commission a sequel because...Hollywood. The good news is, if the sequel wasn't entirely necessary, it is a great time nonetheless. NYSM2 raises the stakes from the Horsmen's first outing, meaning even more incredible stunts that require even more suspension of disbelief. I mean, faking one's death can't possibly be as easy as depicted here (more than once) or everyone who has a crazy ex or owes on a credit card would be doing it! Still, the movie doesn't take itself too seriously, so playing along isn't a problem. Some of the illusions are spectacular, in particular, the rain-manipulation trick hinted at in the trailers, and the plot has plenty of twists and turns to hold your attention. The cast is terrific from top to bottom, with Jesse Eisenberg again the standout. Lizzy Caplan's character is a somewhat brash replacement for Isla Fisher, but she's great fun and will grow on you quickly. Daniel Radcliffe continues to distance himself from his Potter past with a funny, quirky performance as the film's baddie. Now You See Me 2 is great fun and (still) something a little different for the summer blockbuster season. Of a possible nine Weasleys, Now You See Me 2 gets seven. Fangirl points: DanRad in *another* movie about magic!